Have you ever wanted to produce that same perfect latte at home that you enjoy at your favourite café? 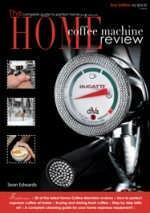 The Home Coffee Machine Review is a guide to making the perfect espresso coffee at home. Learn the history of coffee, growing techniques and production methods – including roasting and the correct handling of the precious coffee bean. We show you how to grind, tamp and extract the sweetest of espressos. We will help dispel the myths about steaming milk and show you the step by step process of milk texturing, including latte art. The Home Coffee Machine Review objectively reviews 20 of the most popular machines in the marketplace today, helping you to make the right purchasing decision. Researched and written by the nations leading café and coffee consultants, learn the real truth behind great home espresso coffee. For single issues please allow up to 2-5 weeks for your first delivery. Your subscription will begin with the next available issue.